Discussion in 'Tutorials and How Tos' started by Cortexitron, Feb 6, 2016. Outstanding. However....I have no idea what these things are. 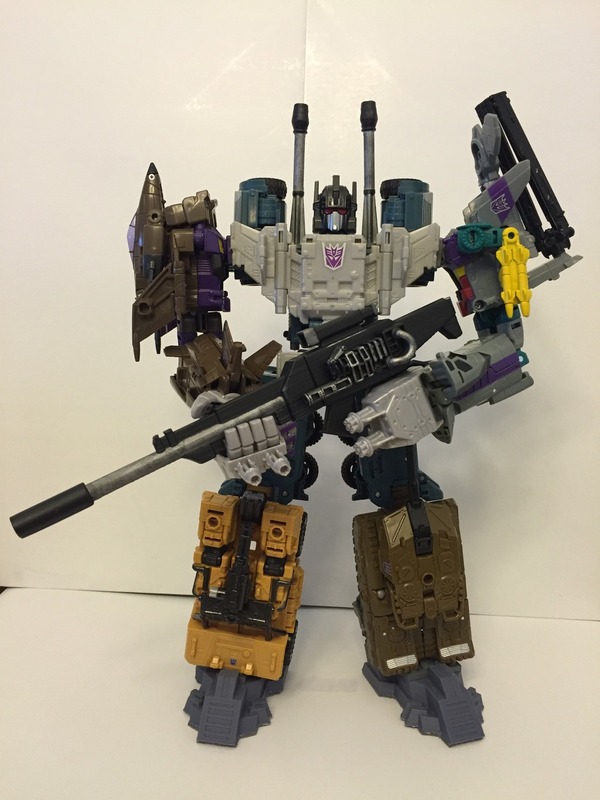 How does it looks with Bruticus with the rotors open?? How did you manage to remove the rotors from both figures? I heated up the pins with a soldering iron an then pulled them apart. The pin in Vortex I drove out with a nail. Just be careful when you pound it out. The pin in Whirl I heated and carefully pulled it apart. First, you get the blades down on his forearm where he can use it as a weapon. Second, when you fold it up, you might be able to make it an arm cannon. I think I'm going to review your thread a little more later on..
To take apart Vortexs rotor, I used a small finishing nail. 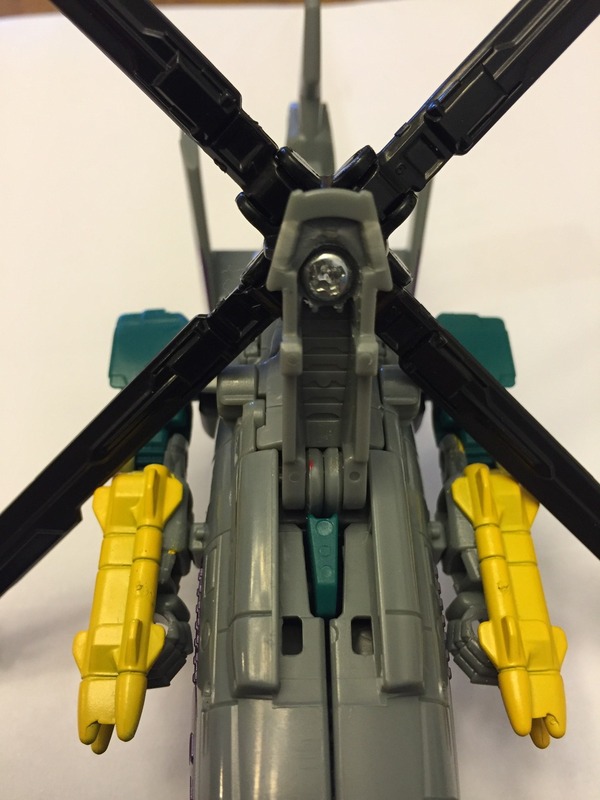 It just fits into the hole that is in the green part of his rotor. I heated up the pin first, as this softens the plastic around it. Heat the pin for a while then tap it out with the nail and a hammer. You may need to give it a couple good hits, but it'll pop out no problem. Make sure you've got it sitting flat, and not on those little tabs used to hook into the top of the legs. It'll leave stress marks from the pounding otherwise. 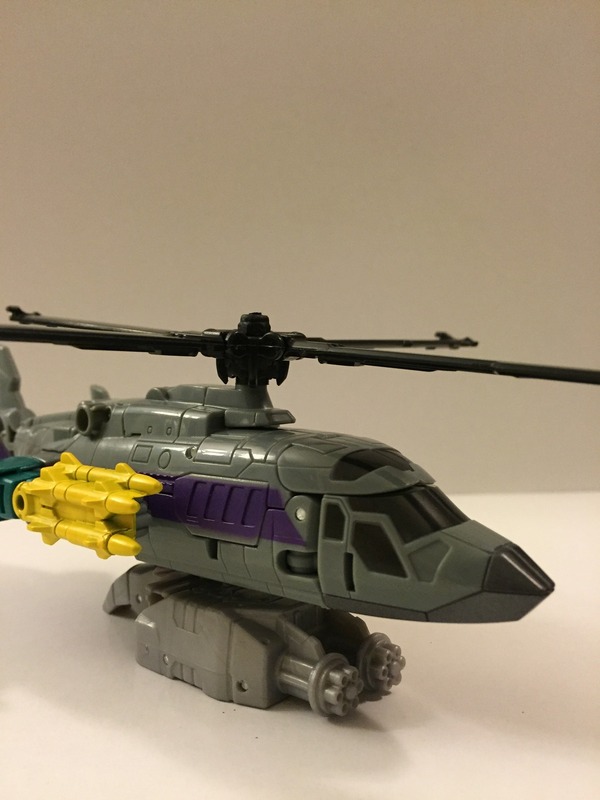 For Whirl, the pin can't be accessed to pound out, so I heated it for a long time, then used a needle nose pliers to wedge it apart. Again, be careful not to mess up the rotor part, but you can mangle the other piece if you need to. 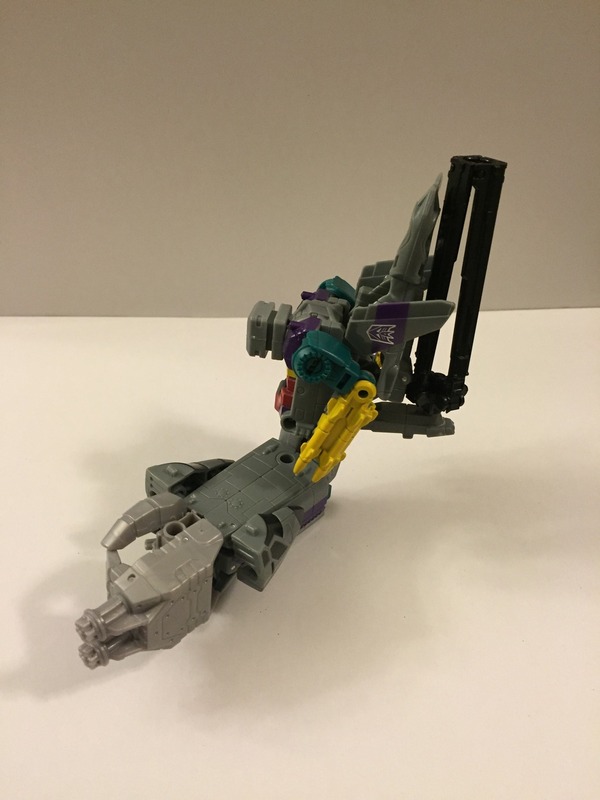 For Whirl, you can also just cut it out, as that piece isn't needed. All is needed is the rotor. For the spacer, because I placed the rotor on upside down, I needed the space so it would spin. You can assemble it however you like, as that's up to you. I believe gbm assembled his the normal way without a spacer and it works fine. This part is really personal preference. Because of the size of the hole in Whirls rotor, I went with a #6-32 machine screw and lock nut. Depending on what kind of screw you use, you may have to make some room under that flap on Vortex. I drilled the hole out to fit the screw, and then just used the tip of a 1/4" drill bit to sort of countersink the hole and things fit fine. Also, you may need to cut the screw to length. I know I did, but I just used one I had laying around. Then it's just touching up the paint to hide the nut and you're good to go. Good luck! 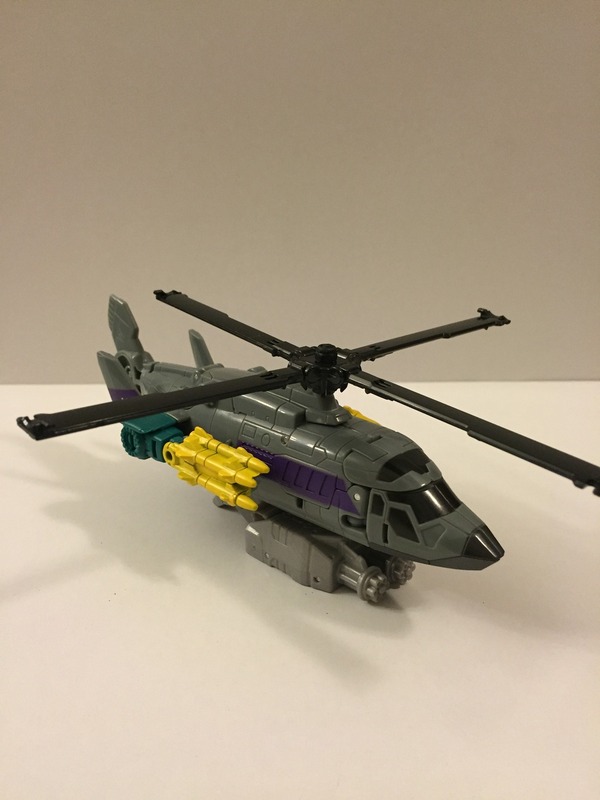 Followup - I did a variant on this myself, and it's RELATIVELY easy, using (almost) only Vortex and Whirl parts. 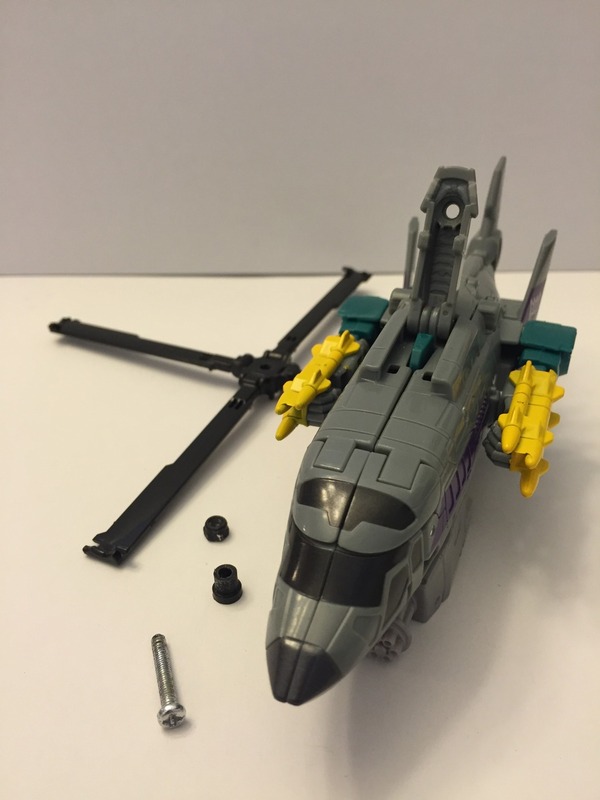 I used the Whirl rotor assembly "right side up" and kept Whirl's pin. I made a very very thin spacer from a sheet of foam insulation (but you could use any similarly thin material that fits into the small hole) and tucked it inside the "top" of Vortex's rotor pin assembly. I then cut the round end off of one of Vortex's loose rotors and cut it down to fit in the "bottom" of Vortex's rotor assembly. Drive the pin back through into the hole in the Vortex rotor (which fits perfectly snug) using a screwdriver, wood block, hammer, and a great deal of patience. The entire process took maybe 30 minutes, and much of that was getting the piece of rotor trimmed down to fit. It's always a plus when you don't have to find something special for an easy modification. Reusing the pin from Whirl eliminates the need for nuts and bolts.